The clean-up has begun in Sydney this morning after severe thunderstorms battered the city and surrounds, including giant hail falling in some parts. Super cells moved through the Sydney basin which saw strong winds, heavy rain and intense lightning smash areas in every direction on Thursday evening, the Bureau of Meteorology (BOM) said. 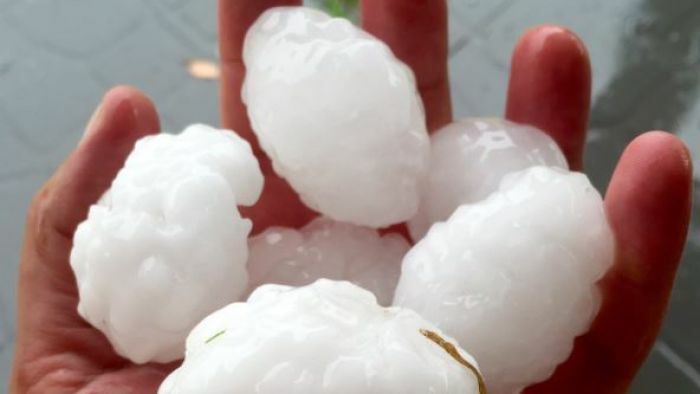 The hail was at its worst in the west of Sydney — with Blacktown, Leppington, Liverpool, Edmonton Park, Stanhope Gardens and Riverstone all being pummelled by golf-ball sized hailstones. Substantial hail damage was reported in Blacktown where 163 calls were made to the State Emergency Service (SES). The north of Sydney saw the heaviest rainfall, with up to a month’s worth of rain falling in Mona Vale. “In terms of rainfall the hardest hit area was Mona Vale on the Northern Beaches which saw about 120 millimetres over a period of about two or three hours,” BOM forecaster Katerina Kovacevic said. Ausgrid said it worked through the night to restore power to around 25,000 homes in the Northern Beaches, Northern Suburbs and Central Coast. Around 1,000 are still without power. Many travellers were forced to stay at Sydney Airport last night after 44 flight were cancelled during the storms. This morning has seen more cancellations and massive crowds at airline check-in from 5:00am. The SES received more than 1,000 calls for help last night and responded to 600 of those. “Most of them were for flood damage, trees on roads and damage due to hail, cracked windows and sky lights, that sort of thing,” Natasha Wainberg from the SES said. There were also three separate rescues in the Illawarra, Blacktown and Narrabeen involving people driving through flooded streets. “It’s a timely reminder that during these weather events, where the water is fast and furious, that we ask people to please stay alert and don’t drive through floodwaters and please stay off the roads when possible,” she said. The BOM predicts there will be a repeat performance today with storms expected to hit Sydney this afternoon, but conditions are not expected to be as severe.